Ballpark Estimate: $2,000 to $9,000. 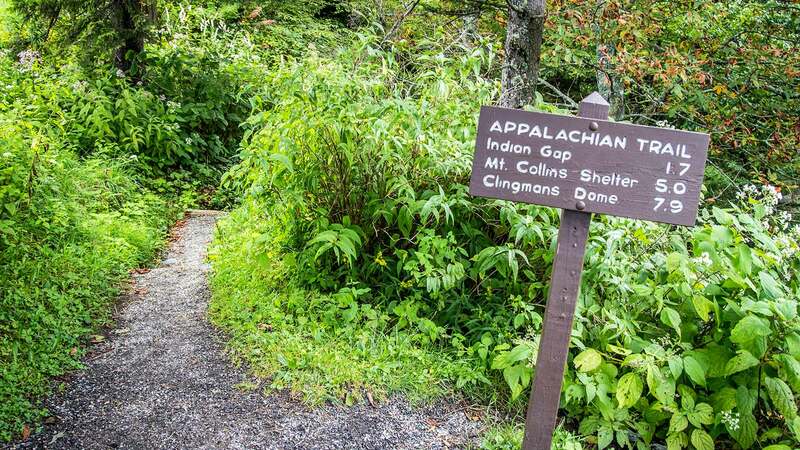 The 2,175 mile Appalachian Trail runs from Georgia to Maine and is one of the most challenging long distance hikes in the United States. Less than 25% of all those who set out to complete this trek succeed. Cost isn’t the only factor in determining who succeeds in completing the AT, but it is at least as important as fitness or motivation. If you run out of money half-way through the Trail, it doesn’t matter that you’re able to hike 20 miles a day with a 40 pound pack and are eager to complete your journey. If you’re out of money, you’re done. Different hikers may spend wildly different amounts for a thru-hike, but most AT thru-hikers will end up averaging between $1 to $4 per mile, or between $2,000 and $9,000. Spending $2,000 for a thru-hike will be a very spartan journey with virtually no creature comforts, whereas $9,000 would be somewhat luxurious (relatively speaking) with a reasonable amount of time spent in trail town motels and restaurants. Assume it takes 6 months for the hike, starting in Georgia in April, ending in Maine in September. Let’s break it down by the above four cost categories. Food: Mail Drops or Trail-town Resupply? You have to eat on the Trail. A lot. But you can only carry about 6-8 days worth of food in your backpack at a time. How do you get more food if you’re hiking for 6 months? You have two choices- mail drops or trail-town resupply. All along the AT are towns that you can walk to or hitchhike to from the Trail itself, most of the time when the trail intersects an auto road. These towns are sometimes few and far between. There is a stretch in Maine where there are no towns or intersecting roads for over 100 miles. But in most of the 14 states the AT goes through, there is a town at least every 30-50 miles that is accessible from the Trail. You can mail yourself a package to any post office in the country. All you need to do is write “General Delivery c/o – AT Thru-Hiker” on the package and post offices will hold the package for at least 90 days. Mail drops will usually require you to have a person back home willing to drop off your packages once a month or so for the next four or five Trail towns you will be heading to. It’s smart not to send more than four or five ahead of time because you may end up behind or ahead of the schedule you made up before you started. Sending yourself mail drops allows you to get a lot of the logistics of the a thru-hike out of the way ahead of time. You can go to bulk supply stores and buy 6 months worth of food for a fraction of what you will pay for the same food in small town stores. Some problems with mail drops are: it makes you dependent upon a strict schedule to reach a post office in the time you thought it would take you to get there, you may end up hating the food you bought and still have to face the thought of four more months of eating the same food. Plus there are postage costs. Assume it takes 25 weeks to hike the entire AT, that will be about $15-20 in postage per food drop, or between $375-500 in postage. You will probably spend at least $2 per meal on average if you shop frugally in advance, or 25 weeks x 7 days x 3 meals x $2 = $1,050. This doesn’t count things like AA batteries for your flashlight, ibuprofen (aka “Vitamin I” on the Trail), shampoo, feminine products, Chapstick ™, sunscreen, etc. A good round figure for 6 months worth of mail drops would be about $1,500. What you save in postage by resupplying every week or so on the Trail, you will lose twice over in the higher prices you will pay for food in small town convenience stores. You will be forced to compromise many times if you opt to buy a week’s worth of food in small town store- there won’t be a lot of lightweight, backpacker friendly food at Mom and Pop camp stores. If you are near a larger town, you might be able to get to a large supermarket to resupply, but remember, you’re walking everywhere you go, so if the store is “only” 5 miles up the road, you either walk 10 extra miles with your pack or you hitchhike. A good round figure for 6 months worth of Trail-town food and supplies would be about $2,000. Since the United States has no universal health care, you need to be concerned with how you’re going to insure yourself if something goes wrong health-wise on the Trail. Perhaps you are covered by your parents’ policy? In which case, you’re all set. Maybe you have an understanding spouse who is willing to work full time while you take 6 months off to go hiking and you’re covered under their policy. Again, you’re all set. However, if you’re on your own without health insurance, it would be wise to take out a short term (less than 12 months) policy with a high deductible. If you’re healthy enough to backpack over 2,000 miles, you’re most likely healthy enough to qualify for the lowest short term policy rates. A ballpark estimate would be about $300 per month for a short term policy with a $2,500 deductible, or $1,800 for the entire 6 months. If you get the flu and need a chest X-ray, you will have to pay out of pocket up to the $2,500 deductible, so you may think “Why bother with health insurance at all?” But if you end up in the hospital for a 2 month stay after being gored by a bull in Tennessee while crossing a field, you’ll be glad you’re not all of a sudden $200,000 in debt! There is an entire range of possible options when it comes to outfitting yourself for a thru-hike. The first thing you should start with are boots. Good backpacking boots that will last 1,000 miles cost at least $200. Figure on buying yourself at least 2 new pairs for the hike no matter whether you’re a novice or a veteran backpacker. The next choice is whether you plan on sleeping in your own tent or bivy sack or whether you plan on sleeping AT shelters the entire hike. Sometimes shelters are full, so you should have a backup plan for sleeping outside in the elements, at least a small nylon tarp that you can sleep under. Another piece of gear not to skimp on is a backpack. An improperly fitted pack may cause more people to quit the trail in the first few weeks than any other factor. Get fitted by a professional in a specialty backpacking store, and remember that “Medium” doesn’t mean anything across brand names, so get fitted for the brand and model you’re interested in. It’s possible to buy most of your needed gear used on Ebay for less than a third of the cost that you’d spend for new gear. In addition, as the months progress, you’ll need to resupply and replace a small portion of your gear, such as socks, boots, gas or propane (depending upon your stove), water filters, etc. It may sound romantic to sleep in the woods every single night for 6 months in a row, but after about a month of sleeping on the ground every night, reality intrudes for most people. As you pass a cheap motel while you walk to the post office to pick up your mail drop, the thoughts of a hot bath and a soft bed are almost too tempting to resist. Even the most dedicated backpackers and camping lovers should budget for at least a few motel nights and a few all you can eat buffets in Trail towns. The great thing about motels along the Trail is that they are, in general, very cheap lodging. Spending $75 for a room would seem like an outrageous splurge. Most rooms would run closer to $40 a night. Also remember you can share a room with fellow hikers you make friends with along the way. Be as frugal as possible, but not so much as you’re suffering constantly. Treat yourself once in awhile to a motel room or go ahead and toss all of the Ramen noodles that you just received in your mail drop and replace them with something you’re dying to eat. The more you don’t hate life on the Trail, the more likely you are to finish it! Happy hiking!